NI myDAQ is capable of streaming live audio signals into and out of your computer. The advantages myDAQ provides over a low-cost sound card include more reliable driver support, complete control of sampling rates, and a known high quality signal path. 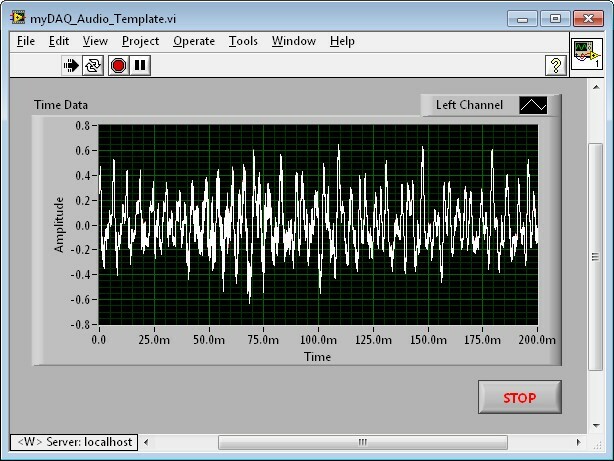 Download the attached file VI myDAQ_Audio_Template.vi and open it in LabVIEW. 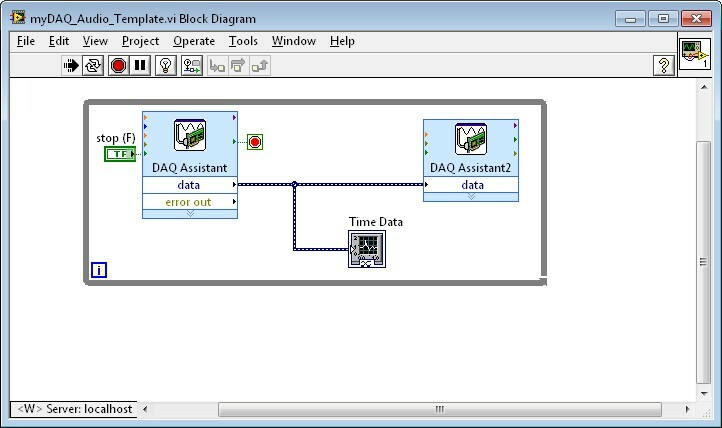 This VI consists of a DAQ Assistant read operation from the Analog to Digital Converter (ADC) that passes data to both the Time Data graph and the DAQ Assistant2 that performs the write out through the Digital to Analog Converter (DAC). The functions appear in a while loop whose stop condition is wired to the DAQ Assistant 'stopped' terminal. This condition changes from false to true when the stop(F) button is pressed. The following terminology will aid you as you learn the functionality of an ADC. The following content discusses the relationships between Rate, Samples to Read, and the frequency of an analog signal. Rate (Hz): Indicates the sampling rate of the analog to digital converter. Recall that the typical human ear can perceive audio frequencies from about 20 Hz to 20,000 Hz. Nyquist’s rule states that in order to properly reconstruct the audio spectrum you must sample greater than 2 times the maximum signal frequency, in this case greater than 40,000 Hz. The units of the Rate value is samples/second/channel. Using the step one above, 100k indicated 100,000 samples per second per channel or 1 sample every (1/100,000 seconds) or once every 10 micro seconds. 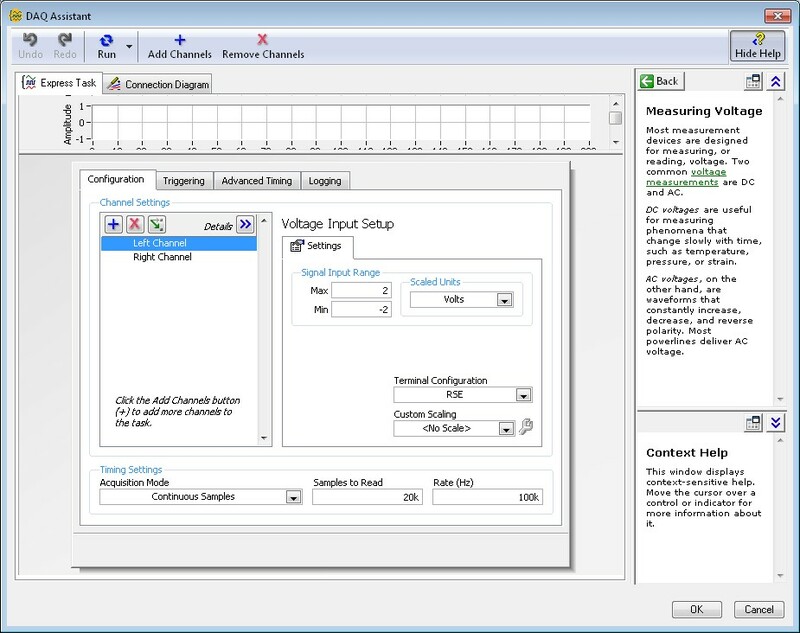 Samples to Read: Indicates the number of samples to read each time the VI runs. In this case the DAQ Assistant read will return 20k or 20,000 data points each time the VI is executed. This also means that the graph will display 20,000 points. The units for Samples to Read is samples. You can also calculate the amount of time represented by each buffer by dividing the Samples to Read by Rate. 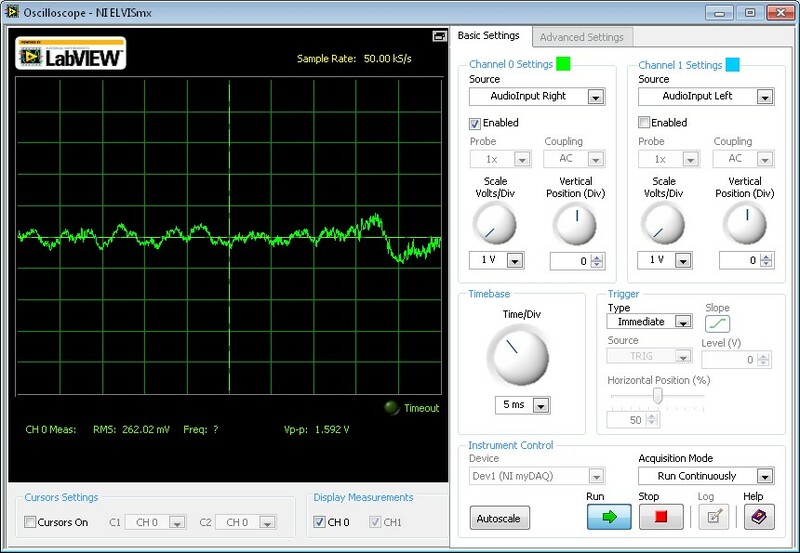 In the case above each buffer represents 1/5 of a second/channel or 0.2 seconds/channel. If the sampling Rate becomes to slow, the audio quality will be affected.